Distinguished from most other ants by their ‘double-waist’, the Myrmicinae together form the largest subfamily of ants. To date there are nearly 7000 named species and 800 subspecies world-wide; in our region the present figures are about 450 and 90 respectively. The second apparent ‘node’ on the petiole is actually a highly-adapted abdominal segment III, with a well-developed constriction between segments III and IV, and it is this above all that separates the Double-waisted ants from most (but not all) others. Many myrmicines have stings, but in a number of species the venom glands are adapted to secrete offensive substances with which the ant drives off or disables its enemies. The pupae of this subfamily are always naked, i.e. the larvae do not spin cocoons. 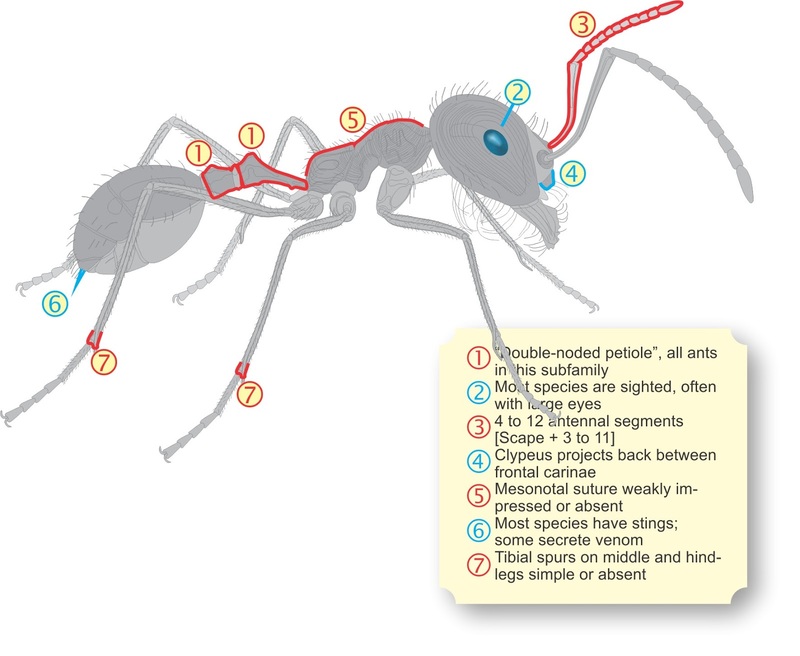 Apart from these features that are common to all Myrmicinae, there is a huge variety of shape, size, habit, etc within the subfamily, although none of the species are as large as some ponerine or formicine ants. Some are harvesters, some are fungus-growers, some may be purely carnivorous hunters. Many live in tunnels in the soil, while others build carton-like nests in bushes and trees, or live in thorns or rotting wood. Sizes range from tiny <1.5 mm to large ants >10 mm. Most myrmicines have well developed eyes, but a few are blind. Some are monomorphic (one size/shape of workers) while others are smoothly polymorphic from tiny workers to large majors. At least one genus has major workers with the most disproportionally-large heads in the business. The subfamily also includes a large number of ‘LBJs’ and ‘LYJs’ (little brown or little yellow jobs), most of which can only be distinguished via a level of microscopic examination that is beyond the reach of most of us. Several myrmicines have become world-wide invaders, forming super-colonies by budding; in our area these include ants from genera such as Monomorium, Pheidole, Solenopsis, Tetramorium and Trichomyrmex. Diagnostic Features: In Ants of Africa and Madagascar Fisher and Bolton comment: “Unfortunately, most characters critical to the diagnosis of members of this vast and morphologically diverse subfamily require microscopic study ...”—hence the following may not be very helpful! Pedicel of two segments, postpetiole usually distinctly separated from the gaster. Pygidium not impressed. Eyes usually present. Ocelli absent. Antennae 4- to 12-segmented. Frontal carinae totally or partially covering the antennal insertions. Clypeus projecting back between the frontal carinae. Promesonotal suture weakly impressed or absent; a functional sting is usually present. Tibial spurs of middle and hindlegs simple or absent. The following are the more important myrmicine genera that occur in Southern Africa. There are several others and some will be added to this site in due course. Click on the genus name for more info about its particular species. There are about 48 species in Southern Africa, of which the most common are the Black Cocktail ant (Crematogaster peringueyi),the Brown Cocktail ant (Crematogaster melanogaster) and the Red Cocktail ant (Crematogaster castanea), which occurs along the south and east coasts and up into the northern interior of South Africa. [b] many species [but not all] build ‘carton’ nests of chewed vegetable matter in bushes and shrubs. Uncommon and bizarre little ants that live permanently under the bark or in the heartwood of the protea Leucospermum praemorsum, and other shrubs. There are two species in our area, but these may turn out to be one after all. Western and Northern Cape, KZN, Mpumalanga and Zimbabwe. These ants superficially resemble Crematogaster until you realise that they are much too hairy. They’re slow-moving, related to the heavily-sculpted genus Cataulacus, but Meranoplus are always much hairier. There are seven species in SA, but they are all very shy, and seldom seen. There are seven species in Southern Africa, of which the Cape Harvester, Messor capensis, is the most widespread in the drier parts of the country. Slow, bumbling ants that run in rough trails, they are most commonly seen on warm evenings gathering vegetable detritus which they carry to their nests. There it is chewed up and used to grow the fungus which the ants eat. There are twelve species in Southern Africa, but only a handful of these are at all common. With their characteristic drooping abdomens they cannot be easily mistaken for any other ants; the genus is unique in that the antennae consist of just 7 segments [scape + 6], fewer than any other ants. There are thirty species in Southern Africa, many of which are very obscure. The true Hotrod ant, Ocymyrmex barbiger, is the most common. The ants run around at great speed and, as the scientific name of this species implies, they have a ‘beard’ or basket of bristly hairs beneath their heads, which seems to be solely used for removing sand grains from their nests. They are most active on very hot days and so are not often seen, although in some arid areas they are quite common. There are about 25 species in Southern Africa, but the genus as a whole is in urgent need of revision and it is in practice extremely difficult to be certain about many of the species without microscopic examination. All Pheidoles are easily recognized by the huge-headed major workers. There are four species in Southern Africa, of which one is a dangerous invader. The ants are polymorphic, living in large colonies in rotten wood, etc. The venom in their painful stings can cause anaphylactic shock in sensitive individuals. This is the largest genus in Southern Africa with some 97 species, many of them obscure and uncommon and all of them small to medium in size. All the species have spines on the propodeum [last segment of the thorax] and distinct creases or ‘wrinkles’ on their heads – you may need a good magnifier to see these.